William Alphonse Maloney (June 5, 1878 – September 2, 1960), born in Lewiston, Maine, was a professional baseball player who played outfielder in the Major Leagues for the Milwaukee Brewers / St. Louis Browns (1901–1902), Cincinnati Reds (1902), Chicago Cubs (1905), and Brooklyn Superbas (1906–1908). 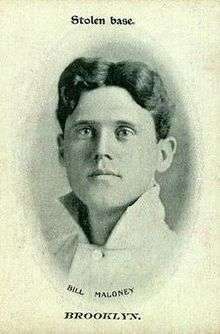 Maloney led the National League in stolen bases (59) in 1905. In six seasons, he played in 696 games and had 2,476 at-bats, 585 hits, 294 runs, 177 runs batted in, 155 stolen bases, and a .236 batting average. An alumnus of Georgetown University, he died in Breckenridge, Texas at the age of 82.